Disclosure: I’m a compensated member of the U.S. Cellular Blogger Brigade, but I love sharing easy recipes and all things Charlie Brown. All attempts at humor are my own. Happy Halloween, everyone! Did you know that October is Eat Better, Eat Together Month? I didn’t, but when I heard about it it got me thinking about how often my family sits down together for a meal. I’ll be honest, it isn’t nearly as often as I’d like it to be, but instead of focusing on quantity I’d like to focus on quality. We’re all adults now so sitting down for a meal is definitely different than it was when my kids were little. I mean, I still do all the work (well, Cody and Paul set the table this morning, so there’s that), but I like that we can enjoy a meal together and have grown-up conversation without worrying about someone making a mess or complaining because they don’t like what’s on their plate. Okay, that one isn’t totally true, but for the most part everyone likes what I prepare and if they don’t they can certainly volunteer to make a meal in the future. If you’re looking for a fun and educational conversation to have then go visit The Family Dinner Project website because they have a timely Halloween one for you this week that focuses on It’s The Great Pumpkin, Charlie Brown. Like I mentioned earlier, all of the meal planning/prepping in my household tends to fall on my shoulders. It makes me a little irritable at times, which is probably why we order takeout more than we did when my kids were younger. It might not be as budget-friendly, but sometimes you gotta do what you gotta do to preserve your sanity. That might sound a little dramatic, but I have a feeling if you’re reading this and you also do all the meal planning in your home then you probably agree with me and you might even agree with me that if you don’t have a plan for dinner it can cause a great deal of stress. I mean, I certainly keep several boxes of mac and cheese in the pantry for those nights when I just need to take the night off, but for the most part I want my family to eat a healthy and satisfying meal. If I plan and shop for at least two meals in an upcoming week I feel so much relief and totally accomplished. It obviously doesn’t take much for me to feel proud of myself and I’m okay with that at this stage of my life. While I have a few reliable dishes I prepare regularly for my family, I also like to find new ones to try, especially if they are quick and easy. Thanks to my Samsung Galaxy S8 and a reliable U.S. Cellular network I can literally search for recipes no matter where I am. Remember when the only way to find a recipe was to look in a cookbook? I know, ancient times. I certainly still love my physical cookbooks, but sometimes it just isn’t practical when I need to find a recipe, say, while pushing my cart through the grocery store. This is why I was so excited to come across the Yummly app! Not only can you find recipes based on specific ingredients, but with one tap you can add everything to a shopping list, which is organized by aisles at the grocery store. My favorite feature, though, is that you can tap the Yum button and the recipe with automatically be added to your virtual recipe box for easy access in the future. 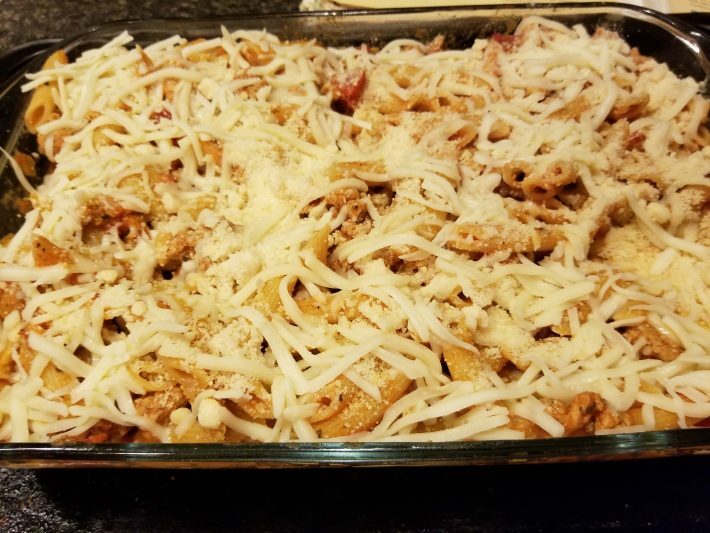 I recently needed a quick dinner idea, so I did a simply search in the app for baked pasta with ground beef and of course it provided me with several results. Based on what I had in my kitchen I used it as a guide and was able to quickly put together a casserole that my family loved. Score! One more go-to recipe for the future that is so easy even my husband or son could probably make it, you know, if they’re ever feeling helpful and domestic. You didn’t think I was going to mention an easy, yummy, healthy recipe and not share it, did you? I mean, geez, I’m not a total monster. Okay, okay I’ve babbled on enough, but I hope you’ll stick with me for a just a few more minutes because I’m not kidding when I say this might be one of the easiest meals you’ll ever prepare for your family. Cook pasta according to package directions to al dente (it will cook more in oven). While pasta is cooking brown the ground turkey on medium heat in a large skillet. Drain fat and return to pan. To the meat add pasta sauce, tomatoes, basil, salt, and pepper. Stir to combine and simmer on low heat. Strain pasta and pour into meat mixture. Add in 1 1/2 cups of mozzarella cheese and toss until everything is combined. Carefully pour everything into a greased 13×9 casserole pan. Top with rest of mozzarella and parmesan cheese. Bake for about 20 minutes or until bubbly and cheese is melted. P.S. Make sure everyone in the family turns off their mobile devices (that includes the grown-ups) so you can enjoy a yummy meal without distractions before heading out for a fun night of trick-or-treating. I love that movie and this recipe looks tasty! I need to try that app for when I’m stuck for dinner ideas! Yum! That looks like a delicious dinner! I need to try this recipe with my family. And that app, I definitely need to try that. I’m always running out of dinner ideas! This is a super easy meal idea. Thanks! My go to meal is usually breakfast for dinner. Right now our kitchen is being remodeled so I am collecting recipes to make when it is all done. I absolutely love the Yummly app! When I can’t decide on what to make for dinner, I always search for something fun and new on their app! I also end up with most of the meal planning – and love Yummly. It’s a great app. I get to try things I wouldn’t think of on my own. What a yummy dinner and I love Charlie Brown. It’s not the holiday without one of their specials to watch. I am always looking for quick and easy dinner. This sounds like it would be perfect for Cheer night! We don’t get home till late and I am always tired. I could totally add this to our meal routine. It’s fast and easy! We love super easy recipes especially in the winter. We actually have one called spaghetti pie and we end up cooking almost this exact thing but we bake it together! It is a fam fave! I love meals like this. Easy to put together in a pinch and they serve so many people!